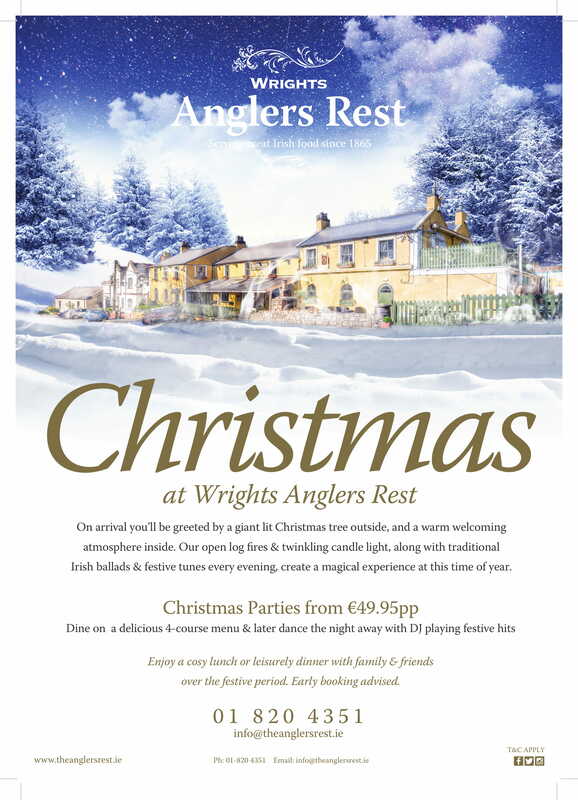 Why book your Christmas Party Night with Wrights Anglers Rest? Our open log fires & twinkling candlelight combined with traditional Irish music create a warm, cosy experience at this magical time of year. Our Christmas party night packages in the Phoenix Room are from €49.95pp, this includes a delicious 4-course menu and DJ for the evening. Minimum numbers apply for this package. Email: jenny@wbg.ie for further details. Enjoy a cosy lunch or leisurely dinner with family & friends over the festive period. On arrival you’ll be greeted by a giant lit Christmas tree outside and warm welcoming atmosphere inside. Our open log fires & twinkling candle light along with traditional Irish ballads & festive tunes every evening create a magical experience at this time of year. Early booking is essential as space is limited. Email: jenny@wbg.ie for bookings or enquiries.